Leah Lamdin is an all-weather cyclists. Today’s picture: Meet another one of Louisville’s “Invisible Bicyclists,” Leah Lamdin. Leah lives in Louisville’s Crescent Hill neighborhood. She just moved here from Massachusetts after graduating college in North Carolina. You should be on the lookout for Leah because you may not see her on her bicycle if you’re texting a friend, eating a cheeseburger, selecting music or smoking while driving your car. Leah shares a place with a group of friends. Her preferred mode of transportation is a bicycle. She uses her bike to commute from her home, which is midway between her two jobs – Cake Flour Bakery on East Market St. and Fresh Market on Brownsboro Rd. I met Leah as she was headed into the Crescent Hill Branch of the Louisville Free Public Library on a cold and rainy Tuesday afternoon. “I don’t mind the weather. You just have to dress for it. So when it’s raining I put on my rain pants and my rain jacket and I go for it.” she said. Her electric smile betrayed the fact that it had been raining off-and-on all day. She protected the saddle of her bike with a plastic bag. 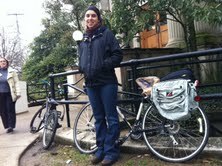 Leah Lamdin biked in the rain to the library. “Honestly, if there is a long, long line of traffic that’s really close and there’s no one on the sidewalk, it feels like the safe thing to ride on the sidewalk. But it’s really much better to get out on the street. If you ride with confidence, you try to trust that people are going to drive around you because that’s their job. You need to keep your eyes open,” she said. With her parents’ hand-me-down panniers to carry cargo, Leah is ready to roll. What keeps her going in all kinds of weather? “It just feels good to be active and getting out and about while I’m going from place to place,” she said. 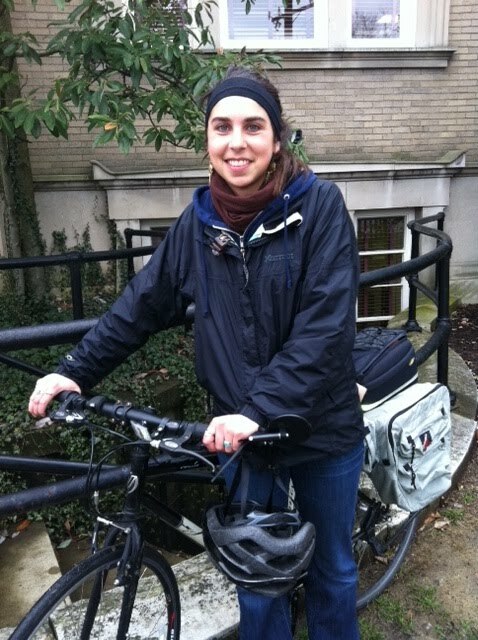 2 Comments on "Day 547 of My Car-Free Experiment – Meet Leah Lamdin, All-Weather Cyclist"